This is a case of why don’t I do this more often? Prepping foods for the week on the weekend makes perfect sense, but it’s also somewhat time consuming. However, whenever I expend the extra effort, I’m so happy I did. I thought I’d share a few of the foods I made ahead for our week (and to stock our freezer with) because it feels amazing to have hot food on the table with no mess to clean up. 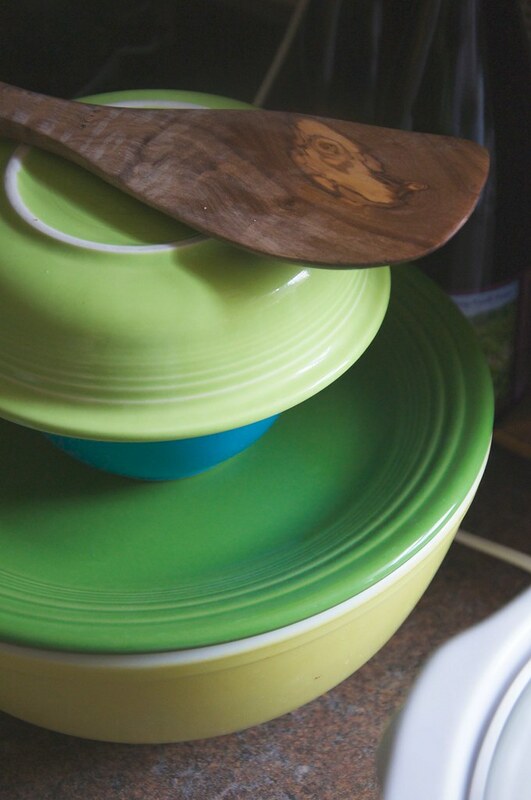 The key with making foods ahead of time is making them simple. I use the slow cooker a lot, which I’ve written about extensively in the past. I also favor foods that need to rise, soak, or otherwise require little attention from me. Here’s some of what I made this weekend. 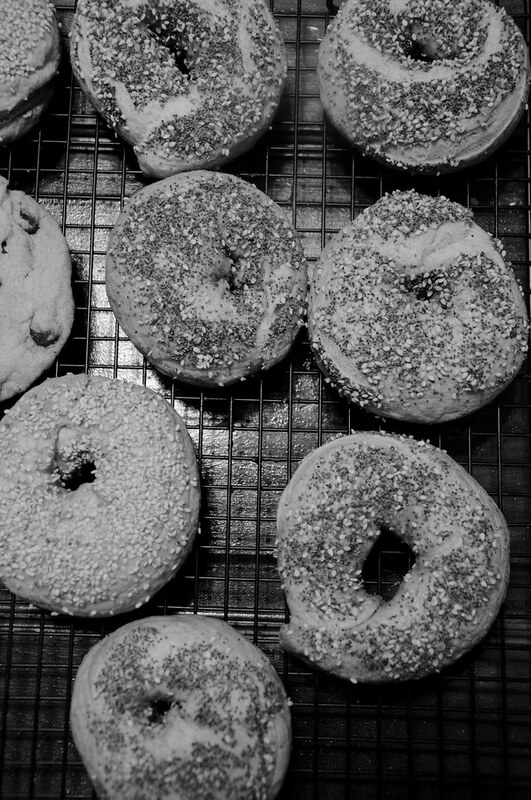 So, I wrote about my bagel-making process yesterday. No, it’s not the most automatic thing, but if you can crank out a few batches at once, you’ll have quick grab-and-go bagels in your freezer for a fraction of the price you’d get them at the store or bakery. I made two batches to add to our upright freezer this weekend. Nom. 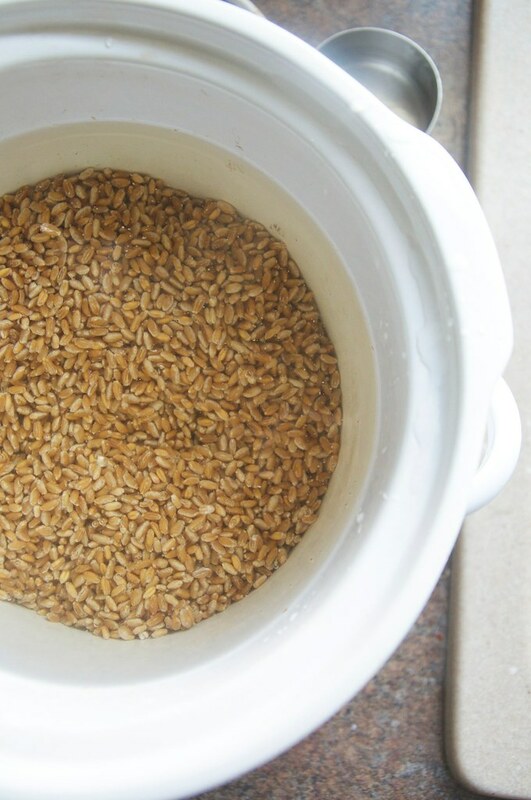 I started cooking wheat berries in our slow cooker a couple months ago because it’s so darned easy. Just toss in 3 cups of wheat berries with 7.5 cups of water. Cook on high for 5 hours, stirring every now and again. This makes 3 quart-sized bags. I keep one in the fridge and freeze the other two (after they’ve cooled completely) for making quick salads and sides. You can even toss them in veggie burgers. I’m going to write more about smoothie cubes on Writing Chapter Three since they’re usually for Ada. I basically blend up whatever fruit we have on hand at the end of the week (this time it was bananas, blueberries, and strawberries) with whatever yogurt is still left in the tub and/or milk (almond, cow’s, etc.). I also added some frozen broccoli to this mix. Blend. 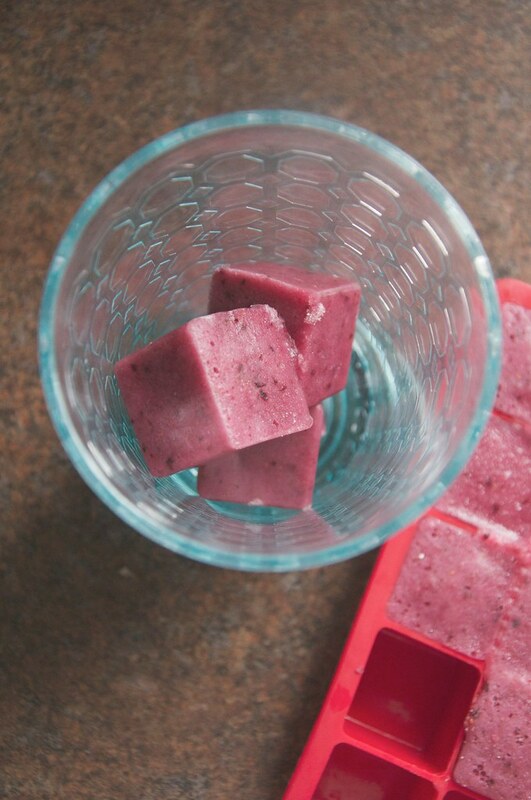 Then I freeze the smoothie into cubes and pop out a few to thaw for quick weekday drinking. Friday night I usually throw dry beans into containers to soak so I can cook them on Saturday or Sunday (sometimes I let them soak two days -- I just chance the water to keep it fresh). This time around I soaked some garbanzos, cooked them, and then made a garlic hummus -- using tahini and water for moisture -- with a nice dose of smoked paprika. 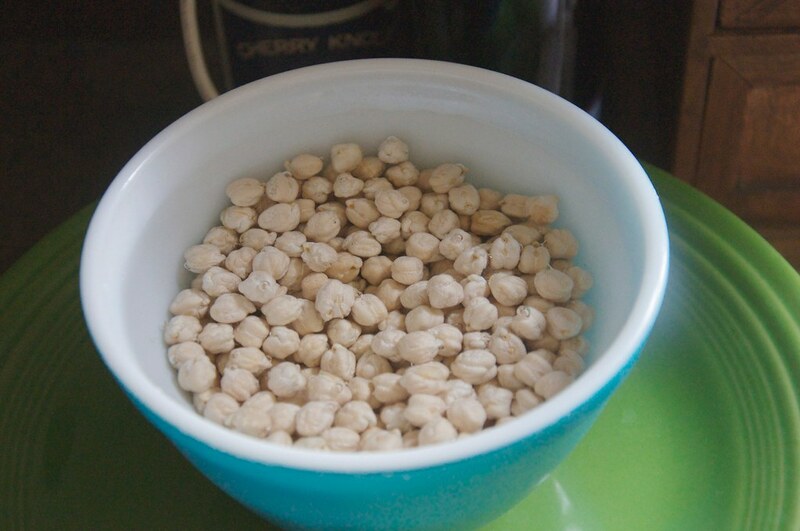 The other container of beans was a mixed bag of white, black, and pinto. I think I soaked three cups in all, which yielded much more. 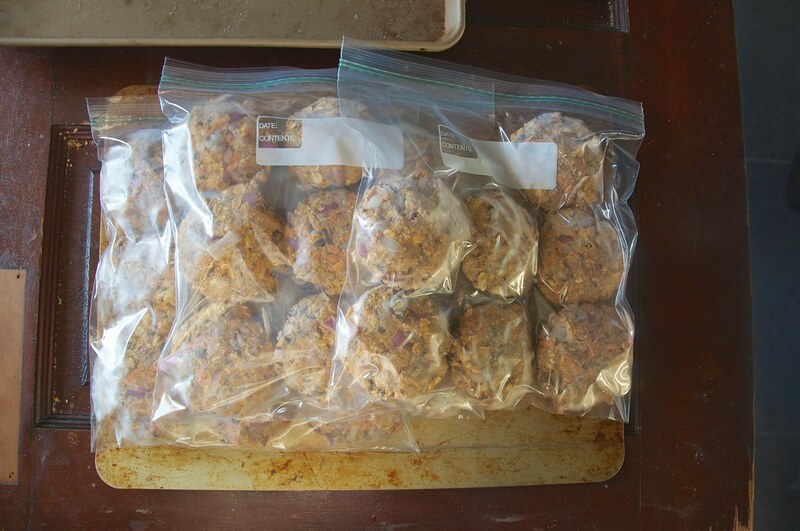 I then made 2 large batches of my Bulk Veggie Burgers recipe. 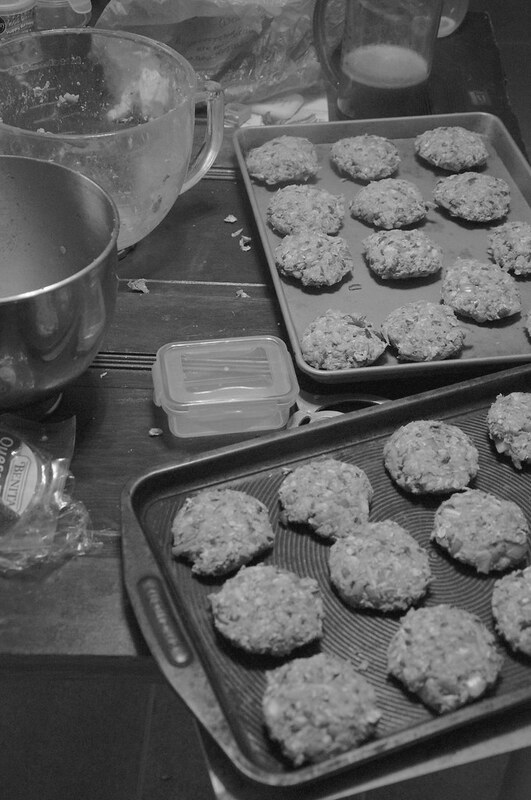 After shaping them into patties, I just put them on a cookie sheet, freeze, and then place in freezer bags. Once you get the hang of this recipe, it’s easy to toss in whatever you have on hand. This time around, I used some salsa, a little leftover cheese, carrots, onions, oats, sunflower kernels, and spices. 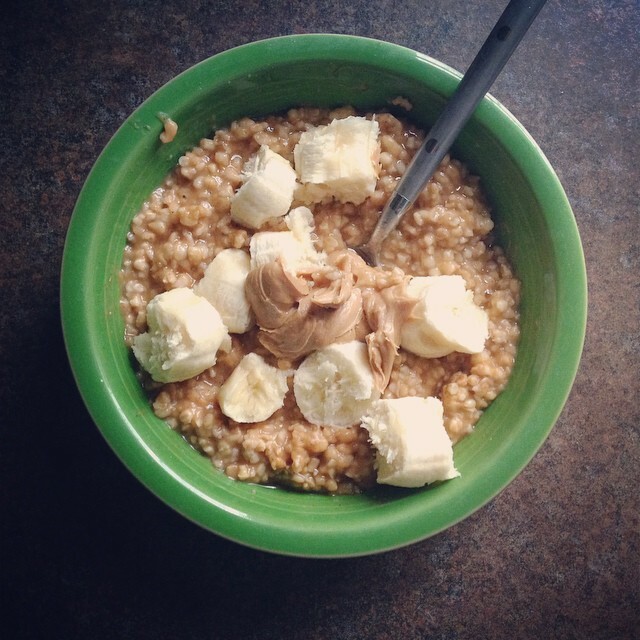 Love this slow cooker recipe for pumpkin pie oats -- and I make it often. Just put 2 cups of steel cut oats in with 6 cups of water and 3 cups of milk (we used cashew milk for fun this time). Then add a can of pumpkin puree or the same amount (around 1.5 cups) of applesauce. Some cinnamon and spice and maybe some vanilla extract if you have it. Then cook on low for around 8 hours or until oats have absorbed the moisture and are soft. Store in your fridge and enjoy for the whole week with different toppings! What are your favorite food prep recipes?